One of the most sumptuous royal palaces in Europe. 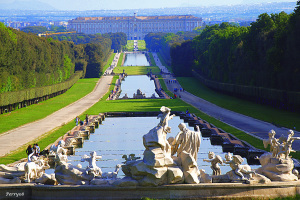 You are able to visit the royal apartments and the great park of the most important dynasty of the southern part of Italy. The construction of the palace was begun in 1752 for Charles VII of Naples, who worked closely with his architect Luigi Vanvitelli. When Charles saw Vanvitelli’s grandly-scaled model for Caserta it filled him with emotion “fit to tear his heart from his breast”. In the end, he never slept a night at the Reggia, as he resigned from the throne in 1759 to become King of Spain, and the project was carried to completion for his third son and successor, Ferdinand IV of Naples. The reasons for building the Palace were to have a new magnificent administrative capital of the Kingdom in Caserta and to protect the court from possible attacks from the sea. The King also decided to build a theatre, a large library, and a university. The Palace might have been a splendid place for court ceremonies, too.